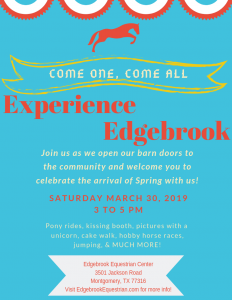 We’re going to have a grand time at #ExperienceEdgebrook! Join us at the barn at 3pm. We’ll have lots of fun horse activities and concessions. Proceeds benefit Edgebrook’s IEA team! **Entry is free! 5 ways to treat your horse! © 2016 Edgebrook Equestrian Center. All Rights Reserved.